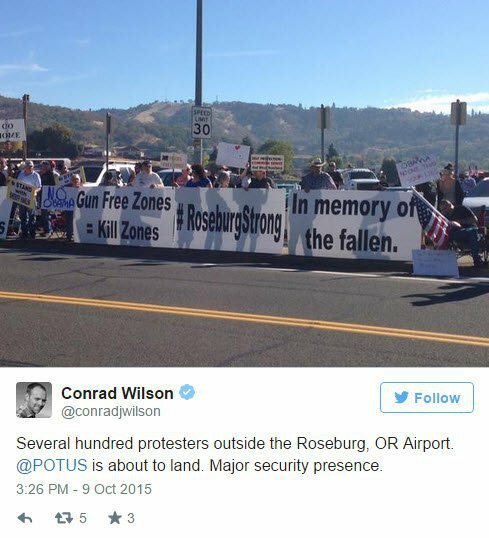 The other day, upon learning of President Obama’s planned visit to Roseburg, Oregon to meet with families of the victims of self-identified conservative Republican shooter “What’s-His-Name,” the Right became so incensed that many conservatives called for President Obama’s assassination. 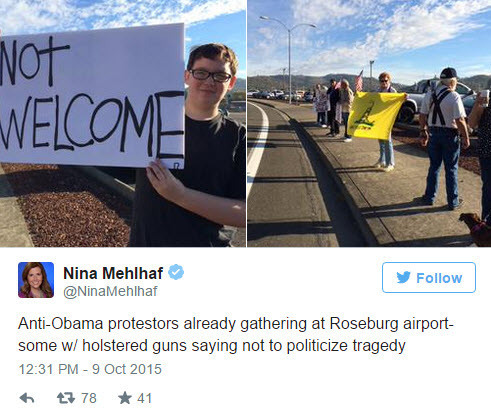 On Friday, the day of Obama’s visit, a mob of conservatives, many of whom were armed, showed up to insult those whose lives were lost in the shooting by complaining about a bunch of nonsensical issues as they told the President he is not welcome ’round these here parts. 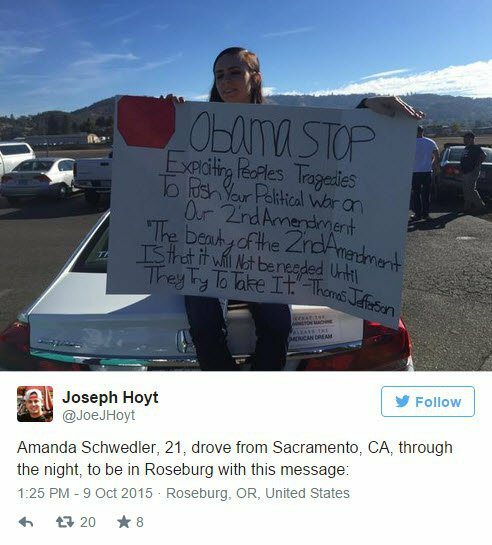 The protesters showed up, seemingly, largely to protest President Obama’s plan to use his executive powers to accomplish some reasonable gun-regulation measures — all as the 46th and 47th school shootings this year took place. 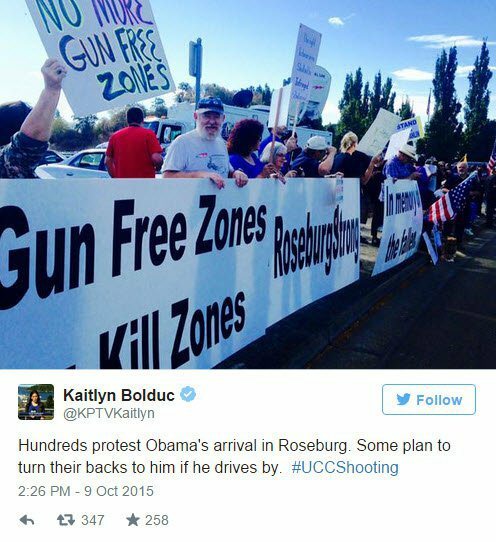 Conservatives have been pushing the false claim that Umpqua Community College was one of their favored pro-gun boogeyman, a “gun-free zone.” Unfortunately, facts are a thing, and the fact is that Oregon law actually prevents colleges from actually banning guns. 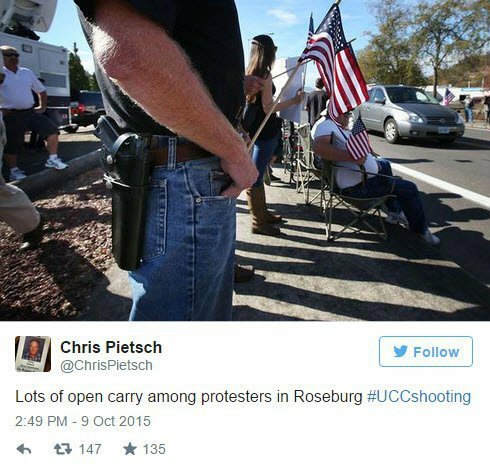 That’s why there were armed students on campus that day. But, as always, Obama remains black, and therefore evil. The Right is furious that, shortly after the shooting, the President reminded us of the importance of keeping firearms out of the hands of the wrong people — like the wave of extreme-Right murderers we have recently seen all across the nation. 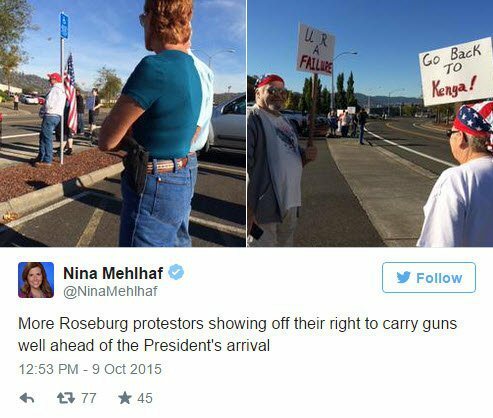 What this mob of armed crazies hopes to accomplish by showing up to protest Obama’s attempt to show compassion to the families of the fallen no one can guess at. It’s difficult to understand the completely unhinged nature of the “your dead kids don’t trump my Constitutional rights” crowd. Despite the armed opposition, President Obama met privately with the grieving families. The President has promised to look into using his executive power to impose a background check requirement for buyers who purchase from gun dealers who sell guns at high volume. This is absolutely not a cure-all for gun violence, but it is a step in the right direction, and may save some lives. 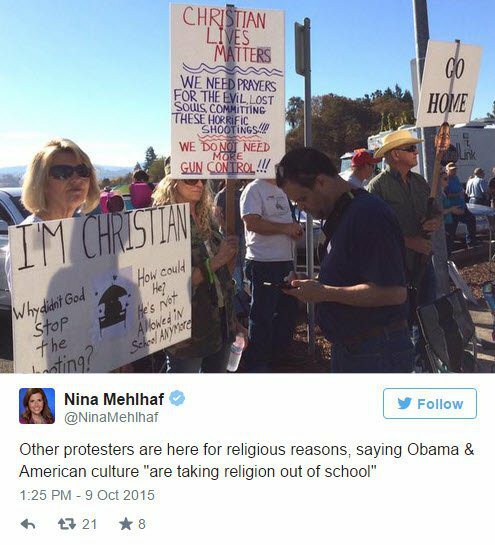 Of course, conservatives will continue to resist progress at every step.